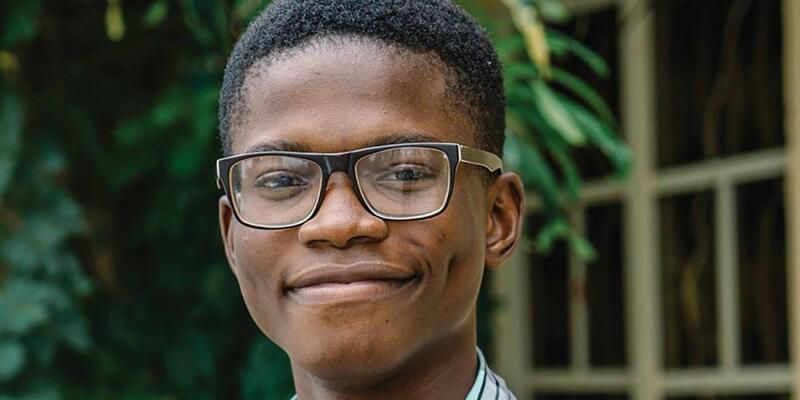 Hi, my name is Chukwuemeka, and I’m a computer science student at Babcock University in Nigeria. I was five years old when I first shared my faith in front of a crowd. It was at a meeting where my grandfather was preaching to people who didn’t know Jesus. He had my friend Niran and me come up on stage to share Bible texts from memory. I did OK on the first couple verses because I was staring at my shoes. But when I looked up at that huge audience, my breath caught in my throat, and I froze. My mind went absolutely blank. I turned to Grandpa in desperation, but he already had things under control. He’d arranged for someone to whisper the rest of the texts in my ear. I remember thinking later that I’d be just fine if Grandpa shared Jesus by himself from then on. But, thankfully, he kept encouraging me, and now sharing Christ is one of my greatest joys. When I was about 10 years old, I became involved in going door to door to people’s homes to tell them about Jesus. I didn’t know these people, and I was really nervous in the beginning. What if I’m interrupting their dinner or their favorite TV program? I wondered. What if they slam the door in my face or have a really mean dog? I wanted to be respectful, so I asked each person whether they had a few minutes to talk with me. If they said No, I’d thank them and go to the next home. If they said Yes, I’d say a quick prayer, thanking Jesus for the opportunity to share my faith and asking for the right words to say. Babcock University is passionate about sharing Jesus. That’s one reason we have a strong Adventist Youth Ministry program, or what we call AYM. Our goal is to share Jesus with the hundreds of students on our campus who aren’t Christians and with the people in our community. I’ve been an AYM member for years, and it’s been one of the most rewarding experiences of my life. I would never have imagined when I was five years old and hearing my knees knock together on stage that someday I’d be preaching to thousands of students during Babcock University’s Youth Week of Prayer. But AYM has sharpened my skills in sharing the gospel and helped me to become bold. The Thirteenth Sabbath Offering this quarter will help build a multipurpose center for our AYM members because currently we have no place to worship or attend meetings that will hold a group our size. The new center will be big enough for our AYM team, plus all our friends in town whom we’ve wanted to invite. Please support our Thirteenth Sabbath project and remember, if you’ve ever felt too young to be used by Jesus, or shy, or afraid you wouldn’t do a good job, God can stop your knees from knocking too!